As we come to the end of this 18 month US election cycle, we are left with the two finest candidates in the nation. The process has obviously worked. No doubt about that. But there a couple also-ran candidates in the race – Jill Stein and Gary Johnson. Gary Johnson gets more press of the two and was asked the other day to name a foreign leader he admired. In a bit of a senior moment, he couldn’t name one. Let me answer for Gary – Justin Trudeau. I am not an expert on Canadian politics but he is energetic, talks physics, surfs, has a fine looking family, and of course, his hair. Sometimes it feels like Canada zigs when the USA zags. When the US elected a youthful Obama, Canada had charisma challenged Stephen Harper. I can’t even remember what Harper looked like. And my memory is better than Johnson’s memory. I think. What am I writing about again? Mmm, cheese tastes good. Does my man crush on Trudeau have anything to do with my choice of two septuagenarian candidates for President? No, of course not. It just means that I like Canada. The Jays. Dill chips too. But not those awful ketchup chips. Or Bieber. They can take him back. 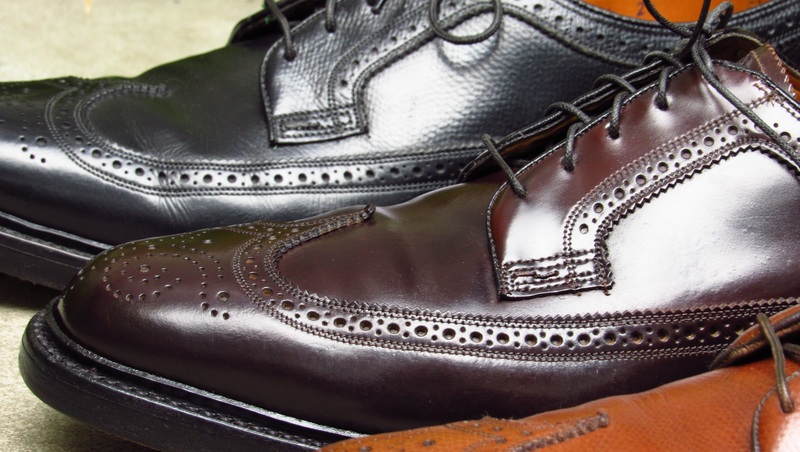 I was going to write this week about burnishing shoes but my photos were terrible. It would have helped too if I took a few “before” shots. And photos of the burnishing process. But I didn’t. vcleat.com may appear to be a well-oiled machine but it has issues. Deep, troubling issues. I will get to the bottom of them in the next staff meeting. 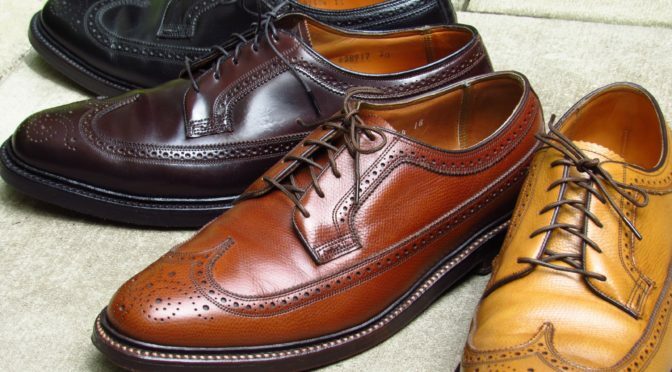 Instead this week I will offer up photos of four Florsheim Imperial long wings. A rainbow of long wings. 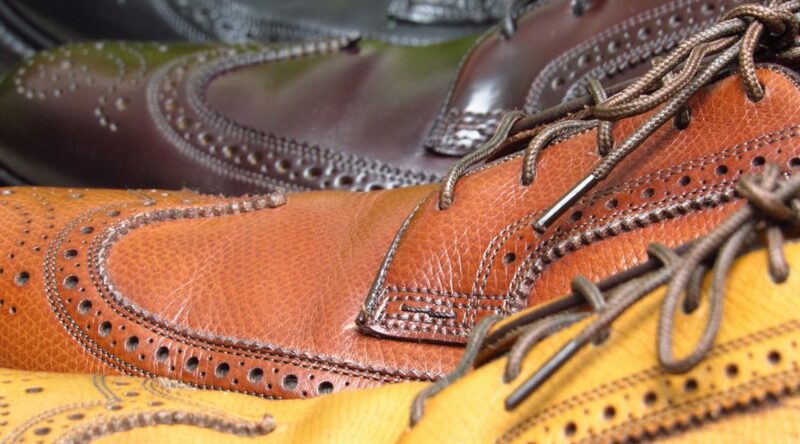 These are models 92604 (black), 93605 (brown Shell Cordovan), 93602 (brown), and 93631 (golden harvest). 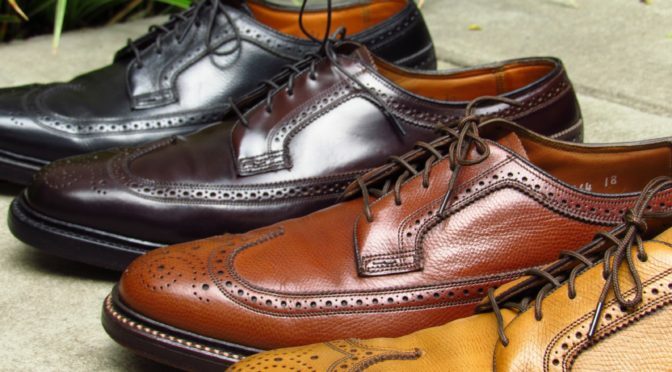 These are the four most common Florsheim Imperial long wings you will find on eBay. I see many eBay sellers list these shoes as made in the 1940s or 1950s. 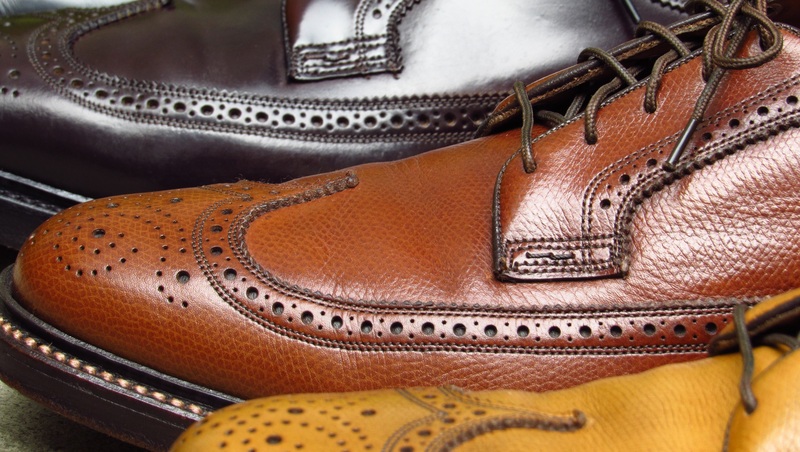 The shoes shown here were made in the 1970s and 1980s. 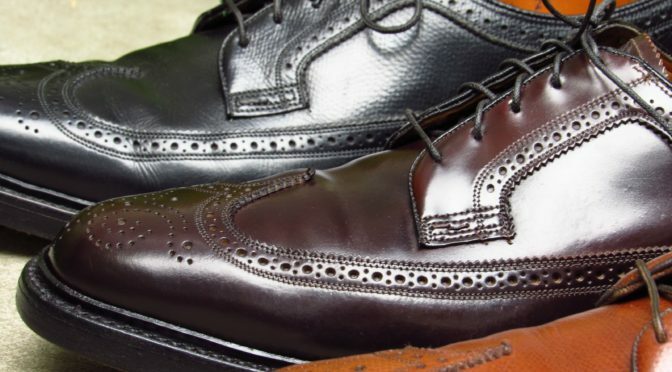 Its very uncommon to find any Florsheim Imperials from the 1960s on eBay. And super rare to find a pair from the 1950s. 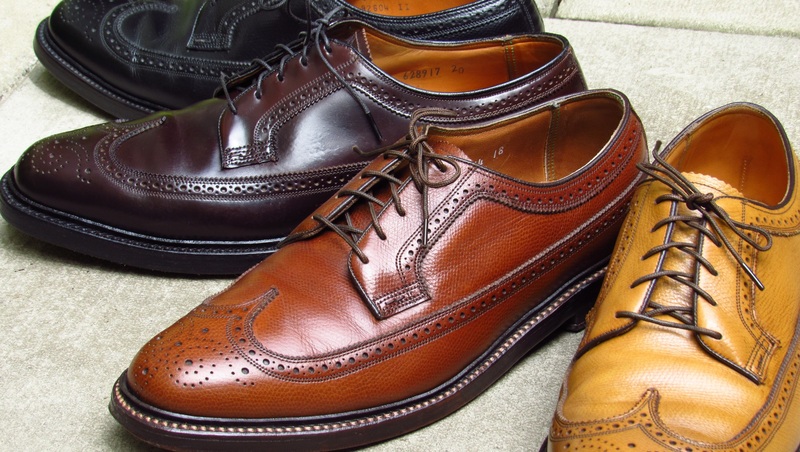 Florsheim made the 92604, 93602 and 93605 from the late 1950s to 1989. Do you have a pair? If not, you need a pair. Or two. I need some poutine. How is the fit on these? 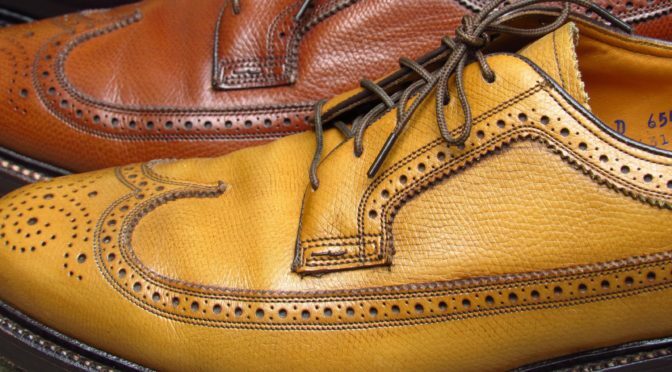 I’m a 9/9.5 EEE in Allen Edmonds, and when I tried on a pair of size 10 D Florsheim Imperial bluchers even my feet were swimming. I really, really want a pair of these. Kenmoors, aren’t they? I have found Imperial Kenmoors from the 70s to 90s to be fairly true to size. I have number of AE pairs and their fit seems a bit narrower than the Kenmoor but it depends on the last. If you can find a store that sells modern Kenmoors, trying on a few pairs would likely give you a guide to the fit for the later period made in USA Kenmoors. When did Florsheim stop making the 93602? Was the 97625 it’s successor and is it identical? I believe Florsheim stopped making the 93602 in 1988. The 97625 is very similar but not identical. I was under the impression the 93602 ended in the early 80’s. I was wondering if anyone knows of a good place to get some work done on a pair of vintage imperials. The sole is coming apart and needs to be redone. Any help would be appreciated. I know a number of people who have used B Nelson in New York. I like the work I have seen from Bedo’s Leatherwork in Virginia. Or you can look on Yelp in your area.